The Anglican Bishop of Edmonton is the chief pastor of the Diocese of Edmonton. The Tenth Bishop of the Diocese of Edmonton is The Rt. Reverend Jane Alexander. 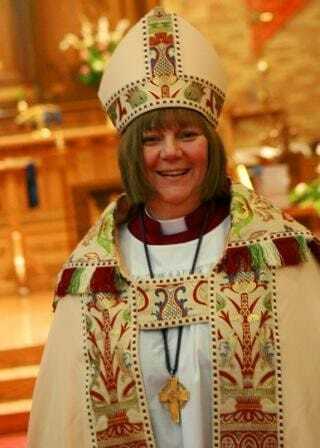 Bishop Jane was elected at the Anglican Electoral Synod on March 8, 2008. Bishop Jane Alexander was born in England and began her professional life in 1981 as a music teacher in Newcastle Upon Tyne. On moving to Canada she earned a Master’s Degree in Education in 1993 and a Ph.D. in Educational Psychology in 1996, both from the University of Alberta. She earned a Master’s degree in Theological Studies in 2001 from Newman Theological College. She was ordained to the priesthood in 2001, served in several parishes in the Diocese of Edmonton and became Dean in 2006. Jane was consecrated and installed as Bishop of Edmonton on May 11th, 2008.